UVC stands for USB Video Class and is a standard that groups certain devices into a special class of USB devices. The advantage of these devices, for instance our USB UVC cameras, is that they do not need any special drivers for operation because a standard UVC driver allows the cameras to operate independently of the manufacturer. Therefore as soon as the user connects the camera to his or her computer, the camera can be used straightaway to deliver images. 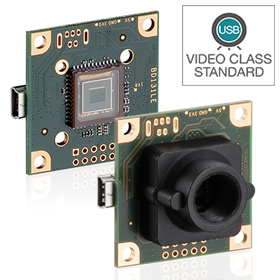 The USB Video Class (UVC) standard 1.1 supported by the camera enables the use of the camera on all operating systems and platforms (Windows, Linux, Mac etc.). Simply plug in the camera and receive images without installing any drivers. The camera is best suited for use as an industrial web camera, in video conference or kiosk systems, in small device construction or in the logistics sector.